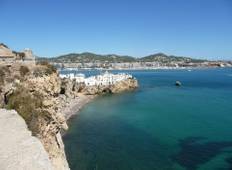 Explore a wide diversity of tours through Ibiza. We have 11 tours that vary from 3 days to 9 days. With the greatest number of departures in August, this is also the most popular time of the year. "Megs was amazing; the best trip manager i have ever had! She is a ball of fun and..."
"Great tour with amazing experiences. So many activities and equal opportunities to..."
"If you're lookin for that perfecto combination of party at night but hanging by the..."
"Wow, i had a great time on ibiza beach Camp. Stayed there 6 Glamping Nichts. Way..."
"I did the Ibiza Beach Camp Glamping. The glamping was good because the glamping tents..."